Coram's Fields is a unique playground and park for children. Description: Coram's Fields is a unique seven acre playground and park for children living in or visiting London. It is open access, provides a calm, safe and stimulating environment where children can play freely and enjoy a varied programme of activities. 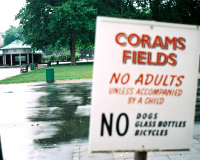 No adult can enter Coram's Fields without a child and our friendly on-site staff ensure that everyone can enjoy their visit. The playground holds a full range of after school and holiday activities as well as a drop-in and events for the under-5's. There is a Community Nursery for children between the ages of 2-4.